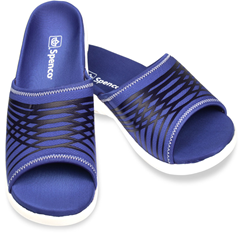 Spenco's new post-workout recovery slides and sandals offer fusion of support and cushioning. The Thrust Slide is one of two Spenco styles that come with memory foam. It’s like taking a high-quality mattress and adding a pillow top. The underside offers long-lasting support, while the top offers comfort and cushioning. Conventional memory foam has always felt soft and comfortable, but it lacked the ability to be shaped into orthotic-grade contours — until now. New for spring, Spenco Medical Corporation has launched a line of structured memory foam sandals and slides. The new footwear offers the initial softness of memory foam with the added benefit of structural integrity, said Jeff Antonioli, Spenco’s vice president of sales and marketing. In Spenco’s rapidly expanding footwear line, the styles that come with memory foam in the new spring line are the Pure Sandal for men and women, and the Thrust Slide for men. They come in several color options, including violet, navy, black and yellow. Technical four-way stretch nylon encapsulates the substantial layer of memory foam that sits atop the Total Support® footbed found in all Spenco footwear. The low-friction fabric helps reduce shear that can cause hot spots and blisters. Silpure Antimicrobial agent inhibits the growth of bacteria that can cause odor. Antonioli said the increased underfoot cushion aids in muscle recovery, while a soft, stretchable cross-strap adds subtle rigidity where it’s needed for an ideal fit. Variable-density pods beneath the foot also help reduce over-pronation and absorb impact. The memory foam sandals and slides retail for $69.99 and are available at running specialty stores, family shoe stores and on the Spenco website. Spenco, a leading producer of high quality insoles and foot care products, helps people everywhere achieve its motto of Love Your FeetTM. Based in Waco, Texas, Spenco provides the most advanced sports medicine and first aid products available, as well as a line of premium shoes for men and women. Founded in 1967 by renowned foot care specialist Dr. Wayman Spence, Spenco earns consumer trust in its products by focusing on superior customer service to distinguish itself in the outdoor, sports, foot care and medical markets. Learn more about Spenco products by visiting spenco.com or calling 1-800-877-3626. Spenco, a leading producer of high quality insoles and foot care products, helps people everywhere achieve its motto of Love Your FeetTM.